These classic sauces, like the mushroom sauce, red wine reduction sauce and others based on the traditional demi-glace, can be served with meat and pork dishes, including grilled steaks, chops, and roasts. This classic Mushroom Sauce can be served with all kinds of roasted or grilled meat dishes, including steaks. It's made with sauteed mushrooms, shallots and just a splash of sherry. The Marchand de Vin (French for "wine merchant") Sauce is a finished sauce made by reducing red wine and chopped shallots with a basic demi-glace. Another ideal accompaniment for roasts and steaks. The Robert (pronounced "ro-BAIR") Sauce is a finished sauce made with onions, mustard, and white wine. The Sauce Robert can be served with any sort of meat but is particularly tasty with grilled pork. Another great sauce for grilled pork dishes, the Charcutière Sauce is basically a Robert Sauce garnished with chopped cornichons. In classical cooking, anything "Lyonnaise" indicates that there are onions involved. 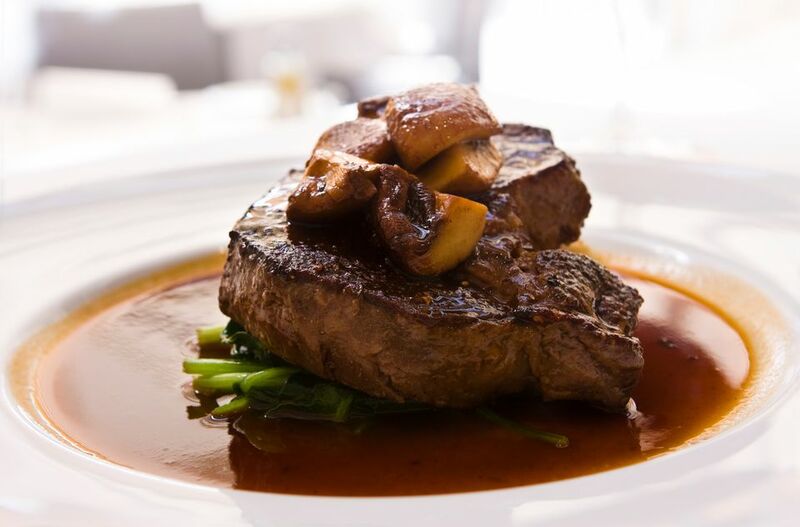 Thus, the Lyonnaise Sauce is a demi-glace based sauce made with onions and white wine vinegar. it pairs well with roasted meats, grilled pork, and even poultry dishes. This version of the Bercy sauce, named after a district in the east of Paris, is a savory sauce for roasts and steaks. It's a lot like the red wine reduction sauce above, only it's made by reducing white wine instead of red. The Chasseur Sauce, from the French word for "hunter," is served with venison, rabbit, and other game dishes. It's made with sauteéed mushrooms and shallots and a white wine reduction. Béarnaise is a rich, buttery, aromatic sauce featuring shallots, tarragon, ​and crushed black peppercorns. Béarnaise is typically served with grilled steak. The Madeira Sauce is made by adding Madeira wine to a basic demi-glace. The Madeira sauce is great with roasts and steaks. Another sauce that's fantastic with roasted meats, the Port Wine Sauce is made by adding port wine to a basic demi-glace.